A wildlife sanctuary has a research team which creates home-like conditions for these animals and breed them until they have reached safer levels. By visiting a wildlife sanctuary one will understand how important wildlife is for mankind. A child will understand the importance of stop crimes against animals and let them be free in their natural habitat. By visiting a wildlife sanctuary a person will realize that it is high time we stop taking measure for our expanding population and actually think about controlling it because we are hurting all the animal and bird species that were created along with us. 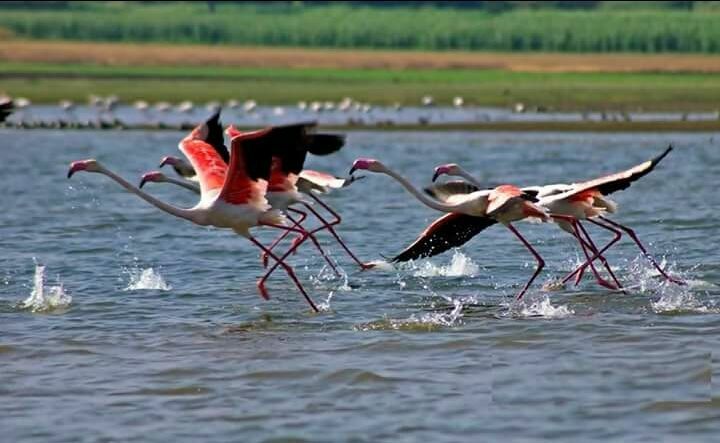 Bhigwan Town is known as mini Bharatpur or Bharatpur of Maharashtra, famous for bird watching, especially flamingo. The small dusty town of Bhigwan has the backwaters of Ujani dam and gives sighting of many varieties of birds such as Flamingos, Ducks, Herons, Raptors, and Waders. Almost all spot wetland birds of the region. Greater Flamingos, Painted Storks, Grey Herons, Black-headed Ibis, Night Heron, Little Cormorants, The Great Egret, Black Headed Ibis, Glossy Ibis, Black Winged Stilt, Black Tailed Godwit, Cormorant, Sea-Gulls, Spoon Bill Stork’s, Painted Stork’s, Pin Tail Ducks, Spot Billed Ducks,Open Bill Storks, Marsh Harrier and many more. 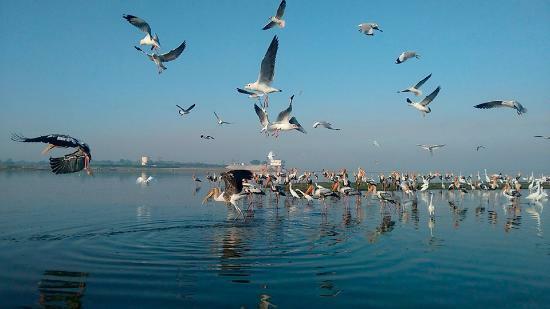 The backwater and Wetland of Ujani Dam in Pune, Maharashtra makes Bhigwan an ideal bird destination. Providing them with lots of food and cool temperature, this place is a paradise to almost 51 migratory birds. Bhigwan birds sanctuary is one of the famous bird’s sanctuary in Pune. Mayureshwar Wildlife Sanctuary is mostly made of the dry deciduous scrub forest of Khair, Hivar, Sisoo, Bern and Karwand trees and interspersed grasslands and apart from the animals already mentioned. Variety of birds visits this sanctuary Indian Roller, Black-winged Kite, Grey Hornbill, Grey Hornbill, Grey Partridges, Eurasian Collared Dove, White-throated Kingfisher, Ashy-crowned Sparrow-Lark, Shrike, Laughing Dove, Blue-cheeked Bee-eater, Indian Silverbills, Eagle and Babblers. Mayureshwar National Park is not only popular for my birds and wildlife population, but also offer stunning landscapes and a kind of natural beauty that will make you come and visit again. Depending upon the season, you can see a lot of birds. 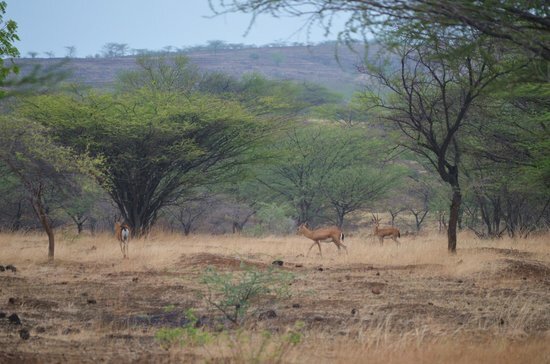 Natural Indian gazelle and wild habitat Mayureshwar Wildlife Sanctuary is no doubt one of the best place to visit in the state and no wonder that nature-loving tourists not only from Maharashtra but also from all over the country visit throughout the year. Tourists vehicles are not allowed to drive inside sanctuary area and need to travel on foot, but the walk amidst wilderness and natural beauty with a very high chance of sighting wild animals in their natural habitat is sure to provide you moments for a lifetime. Mayureshwar Wildlife Sanctuary is a one-day picnic place and a good place to spend a few hours walking around. While visiting me tourists can also visit the Lord Ganesha temple at Morgan. It is one of the Ashtavinayaka Ganesha temples. A blissful town on the banks of the river Koyna is endowed with amazing scenery, crackling waterfalls, serene lakes, and religiously significant temples. Nestled in the Western Ghats, Chiplun-Sangli state highway come as a connection for it to the other parts of the world. The Koyna wildlife sanctuary is a world heritage site residing here, is like nature’s heaven for the wildlife fanatics and nature lovers, harbouring the natural habitat for the rarest of the flora and fauna species. The Vasota Fort, built by Malwa King and Raja Bhoj, lying deep in the forest of the sanctuary, makes for the beautiful visit for the tourists, with Shivsagar Lake gushing on the other side. The well-made 2 nights / 3 days package takes you to all the charming places confined in this soul-fulfilling town famous for its dam and hydroelectricity projects. The comfortable accommodation and quick transport service are also arranged by Tour My India, along with constant assistance from its team throughout the tour. Do you love to watch birds and enjoy tranquillity? Bhigwan can be your next destination. Look forward to enjoying your weekend in the lap of nature. Bhigwan is a small town near Pune in Maharashtra. It is located on the Pune-Solapur Highway and is around 105kms from Pune. It is situated on the backwaters of Ujani Dam. This dam is constructed on Bhima River. The semi-waste water of the dam has created a shallow wetland and is a perfect breeding hub for migratory birds. Bhigwan is a favourite of many travellers who enjoy birdwatching and wildlife photography. Bhigwan is often called as ‘Bharatpur of Maharashtra’. It becomes a hotbed of migratory birds during winter. Around 1000 flamingos come to Bhigwan every year. Other species of birds which can be seen during winter are Painted Storks, Pond Heron, Garganey Duck, Gulls, Bar-headed geese, Raptors, waders, and Demoiselle Cranes. The birds generally arrive between January and February. The concentration of the birds can be observed in two areas i) Diksal-Parewadi area and ii) Dalaj – Kumbharwadi area. It is best to carry some dry food and water along in the Bhigwan trip.